Bathrooms should be tailored to the needs of users and reflect the homeowner’s lifestyle. The basic elements of full bathrooms are the sink, tub, shower, toilet, fixtures, storage and lighting. With this in mind, if you’re planning a bathroom remodeling project, you may want to consider some of the following bathroom design ideas and products to update your space. 1. Eliminate the tub and add a large walk-in shower. Many homeowners are replacing tubs with deluxe showers. 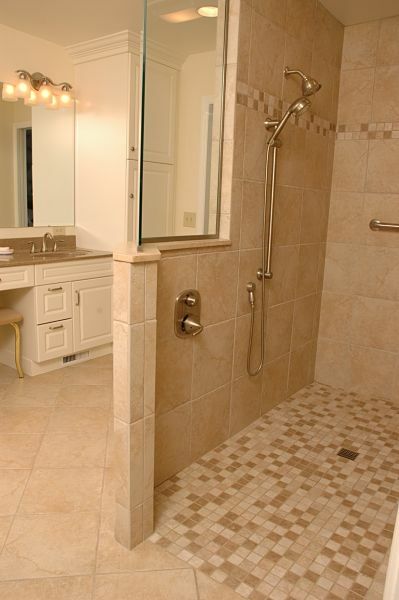 A walk-in shower can be a room within a room, or it can occupy a corner space of a bathroom. Walk-in showers may be equipped with a traditional showerhead, a hand-held spray or multiple showerheads. 2. Add a shower seat. Shower seats are great for storing bathroom essentials such as soaps and hair care products. They also provide support for an individual who cannot stand in a shower and a place to sit for a relaxing shower experience. One of the latest innovations is heated shower seats. A heating unit can be installed under tile to add warmth to your shower floor, walls and yes, the seat. 3. Consider “universal design” elements in planning your bathroom project. There are many universal design features that provide safety and comfort while blending into a stylish bathroom design. Grab bars or proper blocking for future installation of grab bars. Stylish grab bars located in tub and shower areas are designed to appear as though they are towel bars and will support an adult’s weight up to 350 lbs. 4. Give the bathroom a more open and spacious look with a freestanding tub. 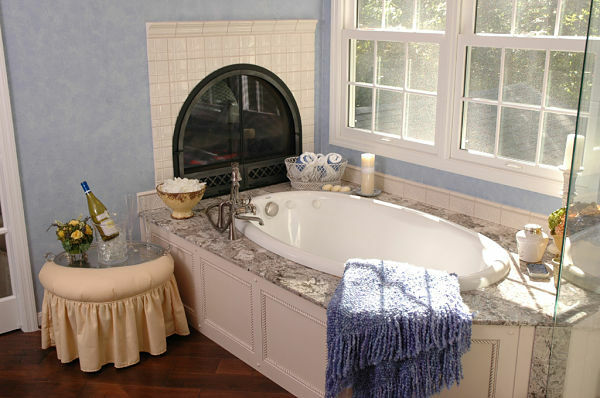 If your idea of relaxation is a warm soothing bath, a freestanding tub should be on your list of “must haves”. Most realtors will tell you that having a tub in at least one bathroom of your home is an asset. 5. Warm your bathroom with heated floors. Heated floors add comfort to bathrooms, especially during our blustery Cincinnati winters, and the heating units are easy to install under tile and laminate flooring. With hectic lifestyles, relaxing bathroom features that people enjoy are whirlpool tubs, showers with multiple jets, special heating units, multiple sinks, versatile lighting, media equipment and other luxury items. Master bathroom amenities include a walk-in closet, exercise equipment, a coffee maker or even a fireplace. 7. 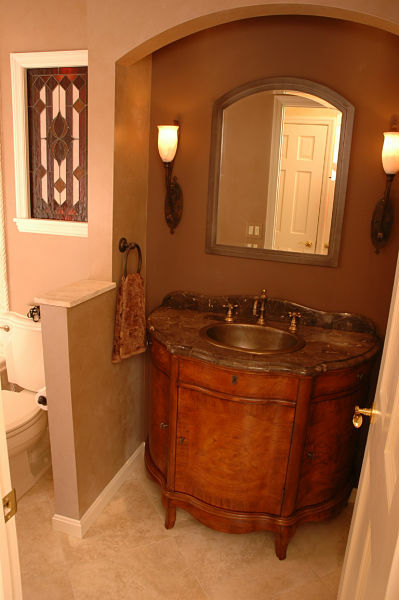 Granite vanity and counter surfaces continue to be the favorite choice of homeowners. Granite is favored for its beauty and durability. Not only is it being used in bathrooms on vanities but it is also used with tubs. Quartz is becoming a more popular product in bathroom remodeling. If your budget is limited consider using new granite-look laminate products. 8. Add elegance to a bathroom with furniture style cabinetry, vanities and accent pieces. Furniture style cabinets work well in powder rooms but are also elegant in master bathrooms. 9. Consider using mosaic tile for its beauty and function. Mosaic tile makes a statement in bathroom design. 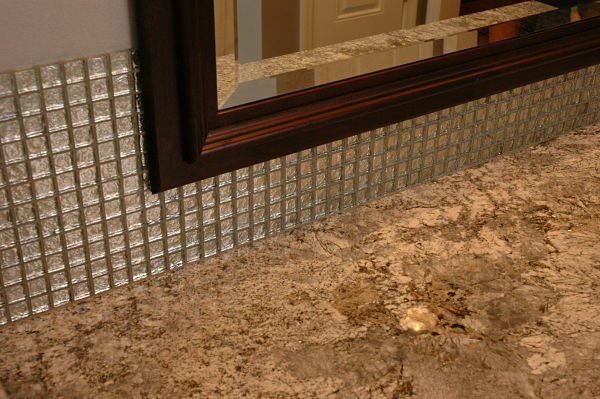 Glass mosaic tile sparkles as an accent and stone provides a no-slip surface when used in flooring. Glass or stone mosaic tile can be used in combination with larger field tile to create a variety of designs. 10. Add eco-friendly water efficient faucets and toilets. Most water consumption in a home occurs in the bathroom. Save on water bills and help the environment by installing water conserving toilets, faucets and showerheads. 11. Check out chrome and polished nickel hardware and fixtures. Shiny, reflective hardware is making a comeback in bathrooms. 12. Rethink “the mirror on the wall”. Gone are the days of the “mirrored wall”. Smaller mirrors in frames add style and interest to bathroom spaces. 13. Bathroom lighting is important to consider in your plans. 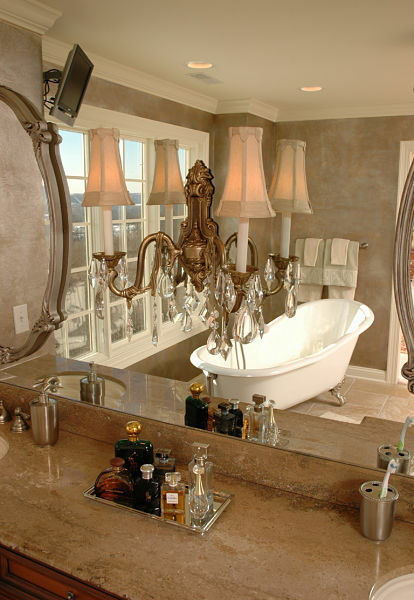 Pendants and sconces can add a little “bling” bathroom. A pendant should hang at least seven feet from the floor to provide adequate clearance. If you are planning to use these fixtures think about how you want to direct the light – uplighting or downlighting – and choose the appropriate light. You will want to illuminate the vanity area where you do your personal grooming and perhaps install a nightlight for safety.